[Istanbul, Turkey] Istanbul is described as the most exotic and most inspiring land in the world, offering some of the best street food around. 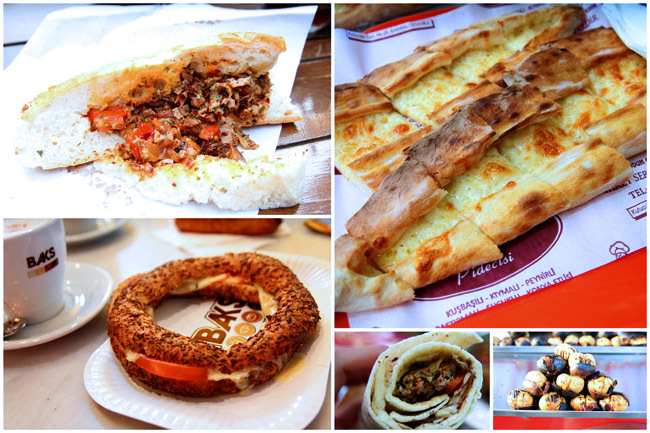 While you are at the old Istanbul Sultan Ahmet area admiring the Blue Mosque, Hagia Sophia and Topkapi Palace, or making some cheap buys at the 500 years old Grand Bazaar and Spice Market, take a bite of their famous kebap, doner and borek available outside these amazing sites. Some of the narrower lanes are worth exploring, and you never know what you are going to find. If you are lost, let the aroma lead your way. 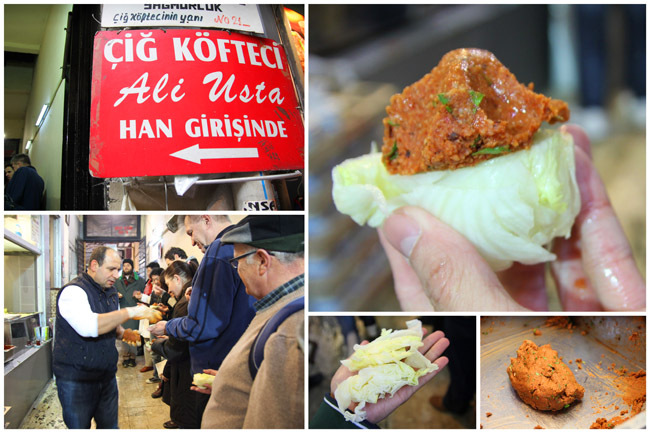 Here’s a list of my 5 Favourite Turkish Street Food, some may take you more to stomach. 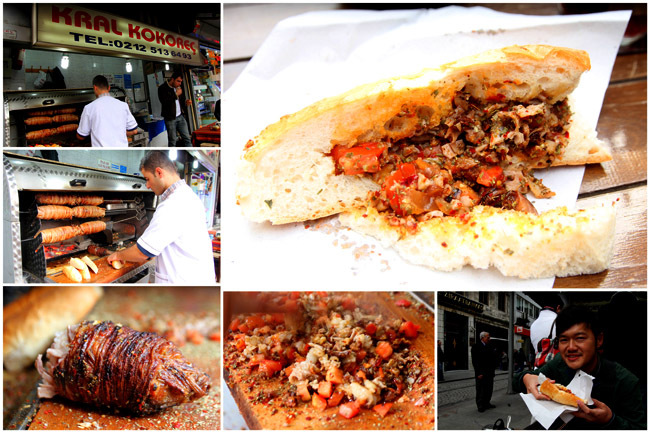 Who would have expected my Number 1 Turkish street food to be a strange-looking sandwich filled with… gasp… lamb intestines! While you may see this to be on Fear Factor, the Kokoreç made with suckling lambs or goat innards is chewy-spicy-tasty. The dish popular with nomadic Turks is first roasted on a horizontal skewer like a rotisserie chicken, chopped with tomatoes and green pepper, and served in a quarter bread. On a normal day, intestines (especially unclean ones) are a no-no for me, but no regrets this time. Sounds a tad gross, so would you try it? 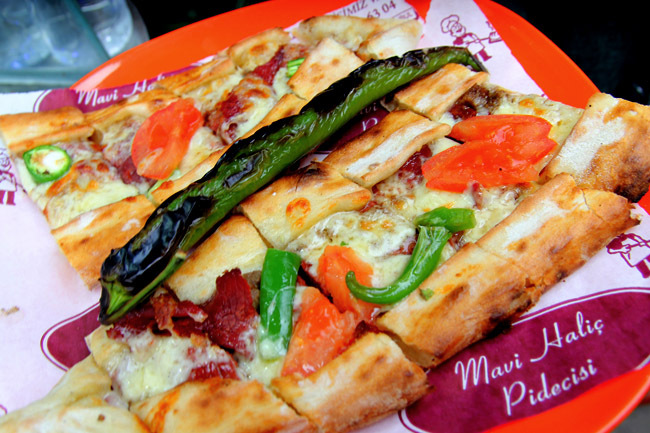 Pide in some countries is known as the pita, a slightly leavened wheat bread usually oval in shape. It almost tastes like the Italian pizza with the exception of a pocket in the middle. This shop, Mavi Haliç Pide Salonu at Kutucular Sk near the Spice Bazaar serves them fresh piping hot, over a large oven for about 10 minutes. Choose your toppings from spicy sausage, minced lamb to my favourite yellow cheese – where simplicity works its best. Singaporeans should be familiar with the Doner kebab, sometimes seen in our pasar malam. 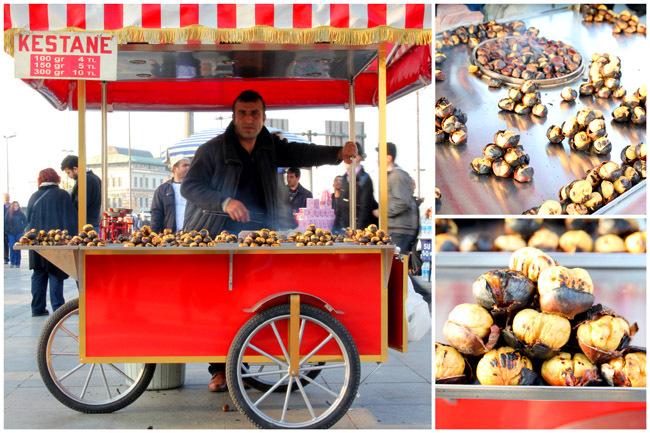 Actually this should be the most familiar Turkish street food sold in various cities. As my tour group did not serve a single Doner kebab the whole trip, I took a detour in the Spice Bazaar to enjoy my Durum (thin roll) sheet in a back alley on a stool where cats roam around. Good decision made. Some do not like the idea of the same meat being reheated every single day (goodness for how long), but who could resist those oily thin sliced meats coming off the rotating vertical spit. A pity for its extremely high salt content. You can call the Simit a ‘Turkish bagel’. 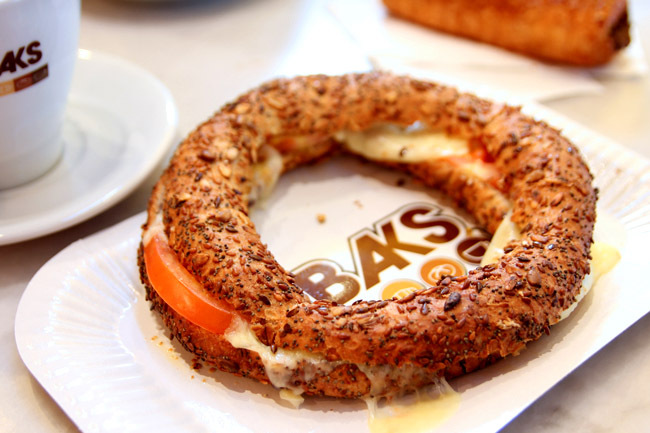 I have seen these ring-shaped savoury loaves in almost every breakfast, almost everywhere at the old Sirkeci area. These are mostly sold in push-cart trollies, though you are likely to see some vendors carrying a tray of the bread on their head! (I only caught one since it was snowing most of the time). Looking like a donut, the simit is slightly crunchy on the outside with sesame seed, and chewy on the inside. Best eaten with soup or humus dips. Kestane The Chinese would call this ‘gao luck’ which simply means roasted chestnut. Even if you are not a fan, its aroma during a cold winter day right outside the Hagia Sophia would tempt you to take a bag. A hundred grams for a bag of say seven pieces would set you back by 4 Turkish Lira, that’s about SGD$2.70 or USD $2.20. If you are nearer the touristy areas, that would be 5. Not too bad, though my preference is with softer chestnuts. An additional choice if you are game to try – I didn’t like it, the others in the tours loved it. Çiğ köfte is otherwise known as raw meat patty, but this hole-in-the wall stall Cig Kofetci li Usta is made of cracked wheat grain. A lump of brown – tell me what it looks like. Word has it that it was invented by Urfa in the time of Abraham. Here’s what you need to do: Stretch up your bare hands, put some lettuce on it, dump a lump of ‘raw patty’, and the owner would squeeze lemon juice right all over. On your hands. Nice! I’ve been planning to go to Turkey in 2014. When I was in Greece, I met a few backpackers who told me about Turkey and it seems like such an amazing country. Were you in a tour group? Young people these days got go in tour group one meh? heh. One of my fav foods there was the Kumpir – a baked potato stuffed (and overflowing) will all kinds of things from veggies to cous cous and pasta! Amazing stuff. Ooooo I don’t think I tried it! you missed out turkish delight! especially the ones with pistachios. Kokoreç is my favourite – funny as well because everyone likes simit but I think it is so dry! Street food is very affordable. All below USD$5 definitely.